webBrowser: Interacts with 1Writer's built-in browser, including to load custom HTML. You can read the entire documentation here. These objects pack some punch, specially the http object, but we'll play our first move on a simpler script. Writing long articles can be overwhelming, specially when you need to find your way back to a specific section, so I wrote a script that prompts you with all the headings of the current document and jumps to the one you select. How this works? First we collect and split the whole content in lines, then we loop through each line and see if it matches a Markdown header (starts with #), we push each positive match to the headings array. We find out the correct position for each heading by checking the length of every line and adding to the lengths variable. It changes while we loop, while for the first line it will be 0, for the second line it will be the length of the first line plus 1 (because line breaks count). If there's any heading, the script will prompt the user with a list, otherwise, will show a HUD error. Then we check if the user actually selected a heading from the list, if not, shows a different HUD error. If there's a selected heading, we jump to that section. 1Writer 2.0 brings a powerful feature for automation in HTTP requests, in short terms, it means you can communicate with web applications to retrieve data. However, before jumping into the script editor, we must learn how an asynchronous function works. All the methods from the http and the ui module run asynchronously, that means the script won't wait for its completion to resolve the next line. I'll exemplify that with a script to set the document's text to the output from an user input. What you would expect from this script? That the user writes some text in the prompt and the callback function returns this data, assigning it to the input variable and only then setting the document to it. However, since the ui object is asynchronous, the editor will set the text to nothing (since input has no defined value) while the input is still up. Therefore, you also can't assign these outcomes to variables. This is a solution for simple issues, more complex scripts would require multiple named functions to move the script in the correct pace. 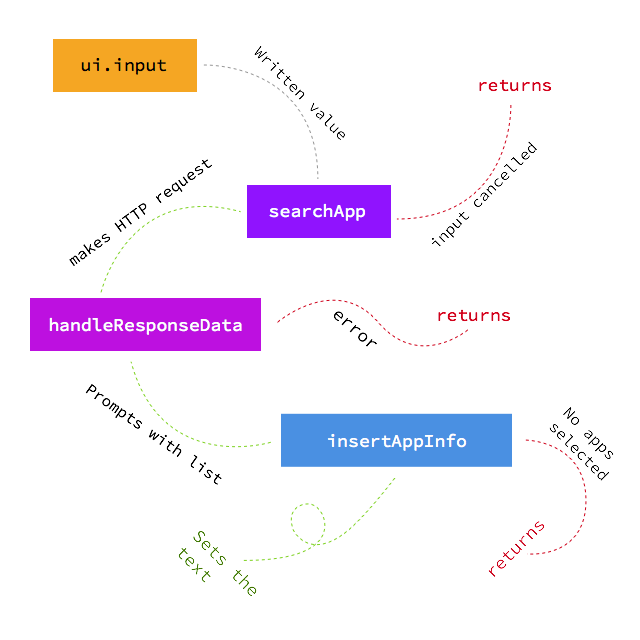 So we'll dive deeper into the structure of HTTP requests using a script sent to me by Ngoc Luu himself to search the App Store. It may look complicated, but we'll split it in bits to explain. Prompts the user and runs the named function searchApp. Which checks if the user didn't cancel the input (if so, returns), otherwise it sends the HTTP request to iTunes. Notice how the first item is the URL; the second is a dictionary with the data we send to the server, like the name of the app and the country. It runs the handleResponseData function with the iTunes response. The handleResponseData function checks if iTunes sent an error, shows a HUD if so, otherwise, maps an array with the data retrieved. Notice how the variable value contains the whole link, yet it returns a more robust element to complement the list formatting. This is a different approach than the multiple arrays I used in the Jump to Section script, because when the user selects an item, it will pass the value to the handler function. Also, the ui.list has a true parameter, indicating you can select multiple items before triggering the insertAppInfo function. How the Get App Link script works. 1Writer has one of the most useful extra keyboard rows out there and now you can set shortcuts to actions in its keys. Just tap and hold on an editable key (they have a tiny triangle in the upper-right corner), choose Set Action... and select an action you want. Then there's the Safari extension. Just as Drafts, you create a template for capture in the app settings, however, 1Writer allows you to trigger actions from the extension, so you don't even need to create a new file to run actions through web content. 1Writer 2.0 was the most delightful surprise this week and probably the best deal you could make this holiday if you write in your iOS devices. I'm sure it is only a matter of time until more actions pop up and improve the pool of options in this outstanding text editor.